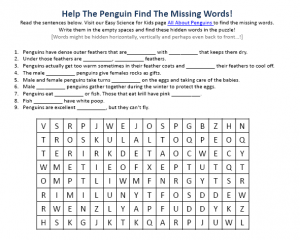 The All About Penguins Worksheet is a FREE to download fun science worksheet for kids with a hidden words puzzle and a missing word seek game. Download our free printables worksheets to make learning science fun for your kids! You are free to download, print and use the worksheet all about Penguins at no cost for children. The worksheet all about Penguins for kids is suitable for Primary school kids in 1st Grade to 5th Grade, as well as for Kindergarten kids and kids in Pre-K. The free printable all about Penguins worksheet for kids makes learning science fun for kids. Use this worksheet printable to get your child’s attention and interest during homeschooling activities or early learning science games. Kids will have fun and enjoy to learn fun facts all about Penguins with this worksheet. Grammar school kids from First Grade to Fifth Grade can use the all about penguins worksheet printable as a reading comprehension tool. Your children shall learn well and remember what they learn about Penguins, because the children will probably need to read more than once the facts about Penguins to find what the missing words are. This exercise will not only improve your kids science knowledge but also enhance their reading comprehension skills. Kindergarten and Preschool kids who do not know to read and write can use the Penguins facts for kids worksheet as an exciting listening comprehension exercise. Parents or Educators can read the fun facts about Penguins and then ask the children to remember what the missing words are. Educators can help the kids learn to recognize words and find them in the hidden words puzzle. Parents can use our free printable science worksheet about Penguins to do early learning activities or homeschooling science lessons with their kids. Teachers can utilize our Penguins free printable worksheet to interest children during science lessons at school and teach kids fun facts about Penguins. Tutors and Educators can use our free printable all about Penguins worksheet for kids to supplement extra-curricular science activities and after-school science enrichment programs. EasyScienceforKids.com is the best fun science for kids website with free to download science worksheets and easy science hidden word puzzle games. Download our free science printables to make learning science a fun experience for your kids! Penguins only live in the South Pole. Most penguins live near the sea, but migrate inland to mate and have their babies. Emperor penguins are the biggest of all penguins. Penguins are not afraid of humans. What do Penguins eat? How do Penguins care for their babies? Learn more fun facts about Penguins by downloading our free all about Penguins worksheet for kids! [sociallocker]Download our free printables science worksheet all about Penguins for kids. Download the FREE All About Penguins Worksheet for Kids! Did you enjoy the free all about Penguins worksheet? Read lengthy information about Penguins here. Declan, Tobin. " All About Penguins Worksheet - Download Free Printables Science Worksheets - ." Easy Science for Kids, Apr 2019. Web. 23 Apr 2019. < https://easyscienceforkids.com/all-about-penguins-worksheet-download-free-printables-science-worksheets/ >.